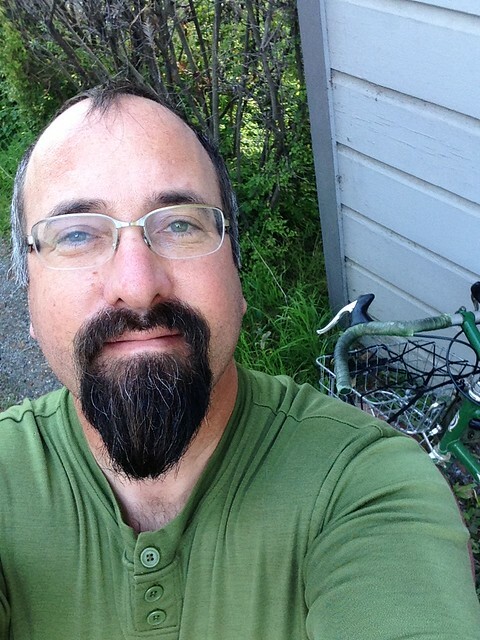 UI/UX Designer, bike nerd, artist. Posted on December 9, 2017 December 9, 2017 Categories rambles5 Comments on Why no blog posts in a year? 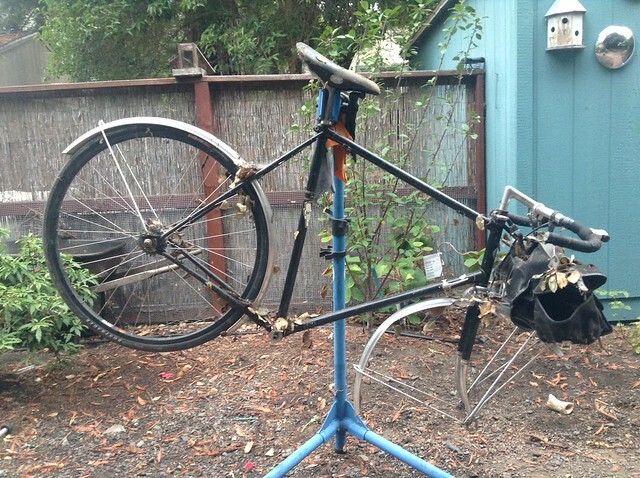 One of my current project/brainworms is to convert my Bontrager to a fat-tired road bike. I swapped the SID Dual-Air for a Kona P2 canti fork, and bought some phenomenally expensive (for me) Compass Rat Trap Pass tires. 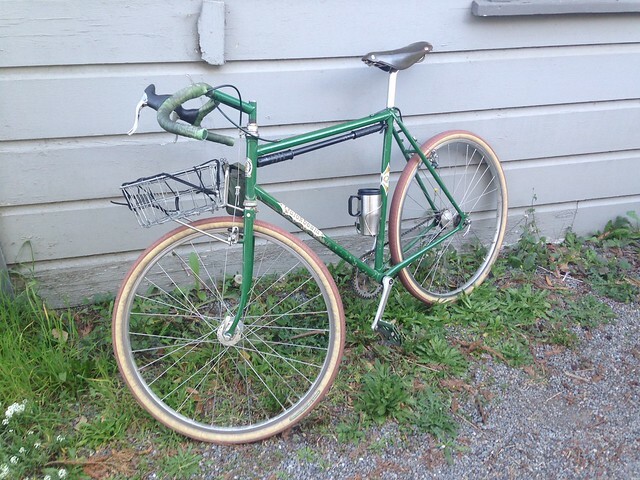 I’d been planning the conversion for some time, but changed the fork the day after I rode down Mt Tam and back to the top with knobbies and a suspension fork. I visited a couple of cool bike shops in Sebastopol, and got some bar tape, since I like to buy something when I visit a shop. Black bar tape replaces the dingy faded cloth tape, looking a little more intentional. Spot the electrical tape fanciness on the stem! 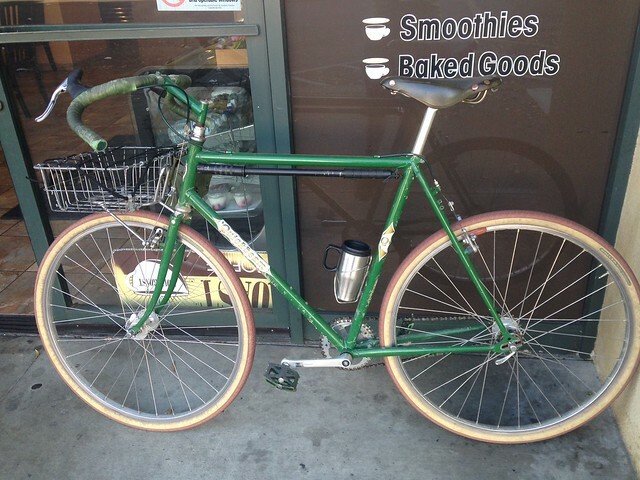 Here’s the “finished” bike, still wanting an LD stem, black bar tape, and A23 rims for tubeless setup. Maybe a setback (or just fresher-looking) 27.0 seatpost. 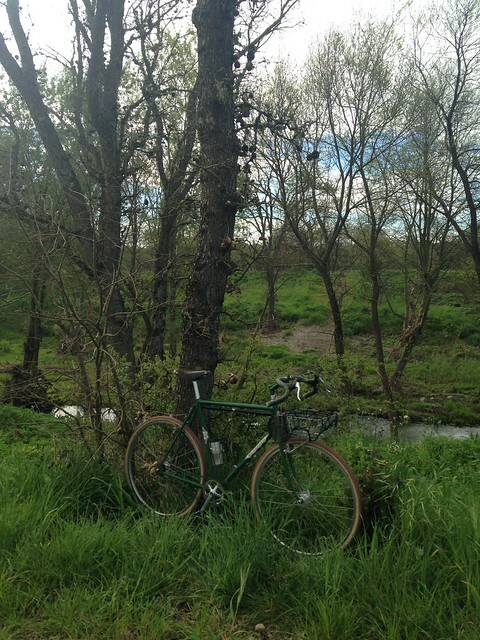 I rode it for a week with the rigid fork. Less funky dive in the corners. I like it. I chose the canti-only fork because it’s lighter, I don’t like extraneous bits, and I’m happy with V-brakes on this bike. 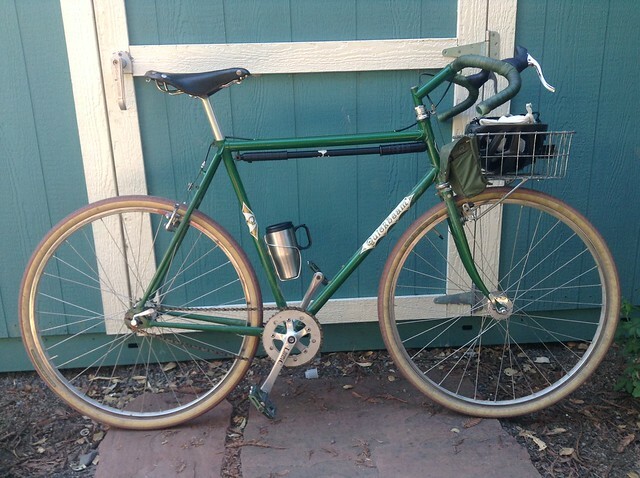 This was always a fine bike, and it came with Bontrager-modified King hubs. The pre-order sold out, and then some. I never made any tee shirts, wall signs, or aprons. Basically, working with Walter at Falls Creek Outfitters is fun and easy, and those other things are not. I have a new run of Biketinkers Union patches in hand, and they’re up on the Etsy. $6 each, and $1 shipping covers as many as you want. Basically, if you want in, you’re in. I have friends who also head secret societies, and they have rule-sets ranging from robust (3) to succinct (2). We have no proscriptions or prescriptions. If you’ve ever taken a wrench, a sharpish stick, or a length of duct tape to a bike, then you’re probably a bike tinker. Sheldon Brown. 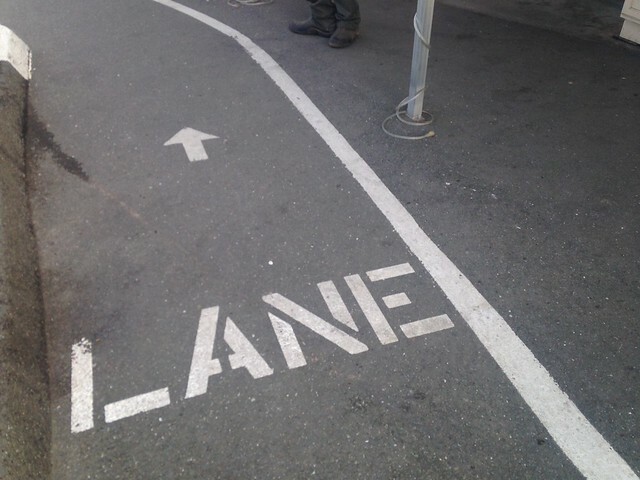 He’s the atheist patron saint of all bike tinkers. If you have a weird bike question, or wonder why this 26″ tire isn’t fitting on that 26″ rim, go to sheldonbrown.com, and AASHTA! NOTE: The Bernie “pig” patches are all gone, as is the Bernie “flaming head” patch. Sorry. Posted on April 19, 2016 December 8, 2017 Categories bike art, Bike Tinkers UnionLeave a comment on Biketinker Patches! 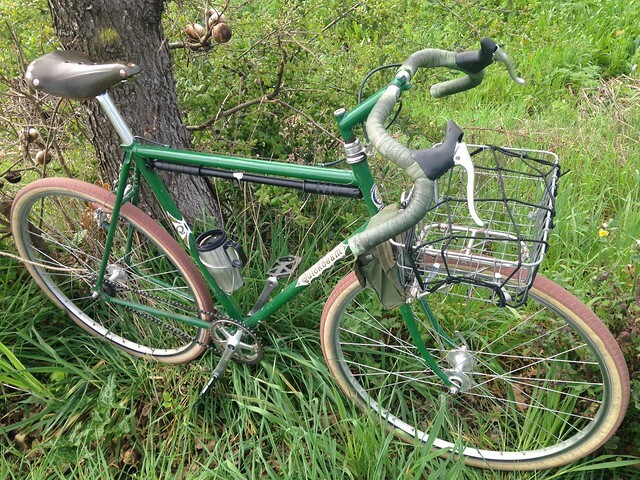 Obsidian Monarch in Oakland can refurbish your Brooks (or other) leather saddle. Once again, I tried to sign up to test a new Brooks saddle, and once again their site failed to work with Chrome. If you want to sign up, do it in Safari. 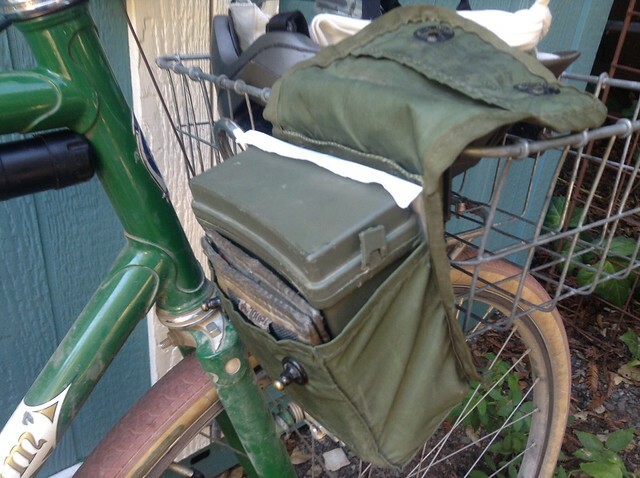 Posted on February 21, 2015 Categories bike art, rambles2 Comments on Redlands Strada Rossa patches! 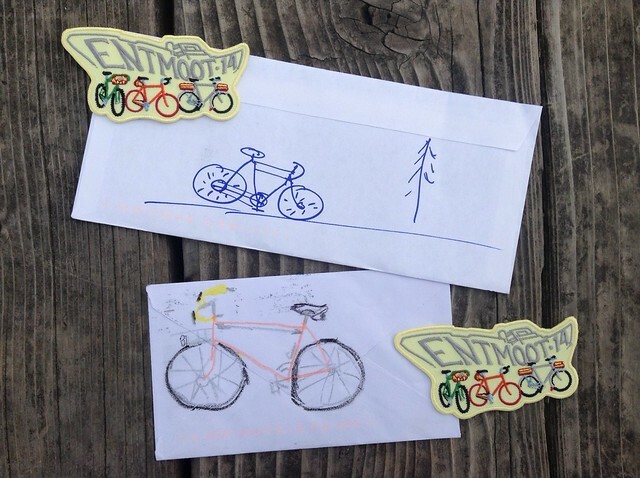 Every Bay Area Rivendell Rider who mailed me an SASE* from Canyon, CA (a place fighting to keep its post office) last Sunday got a free Entmoot patch. 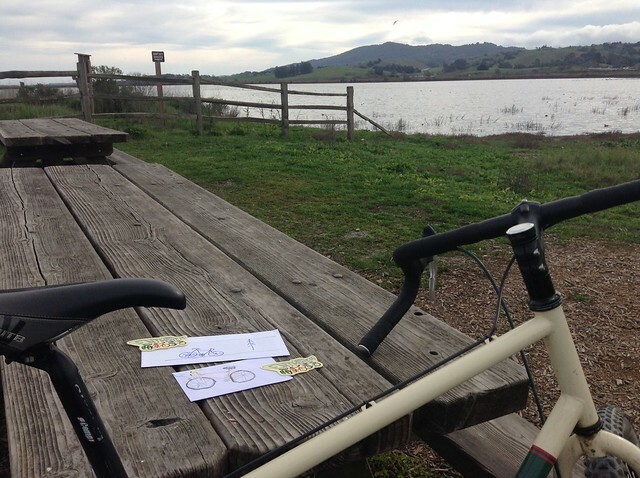 A bike drawing was worth extra points, but was not required. These are the outgoing patches, with the incoming envelopes. Cool stamps were also worth points. *Self Addressed Stamped Envelope. From the old days. 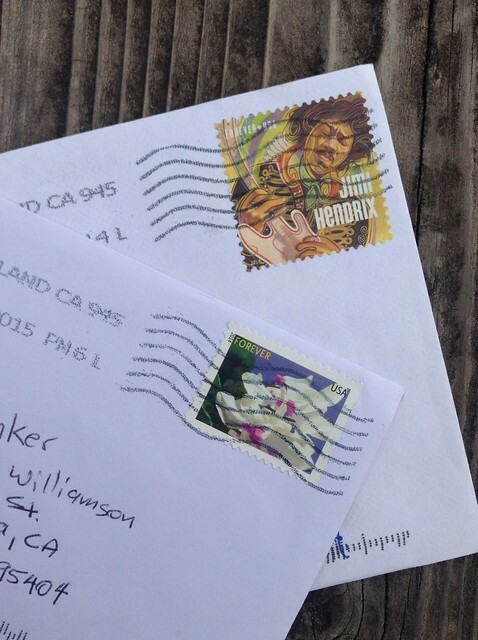 You buy two stamps, and two envelopes. On one envelope, you write your own address, affix a stamp, fold it in half, and put it into the second envelope, which you mail. Someone puts something in the first envelope, and mails it back to you. Pedals and bottom bracket (BB) cups aren’t all threaded normally. 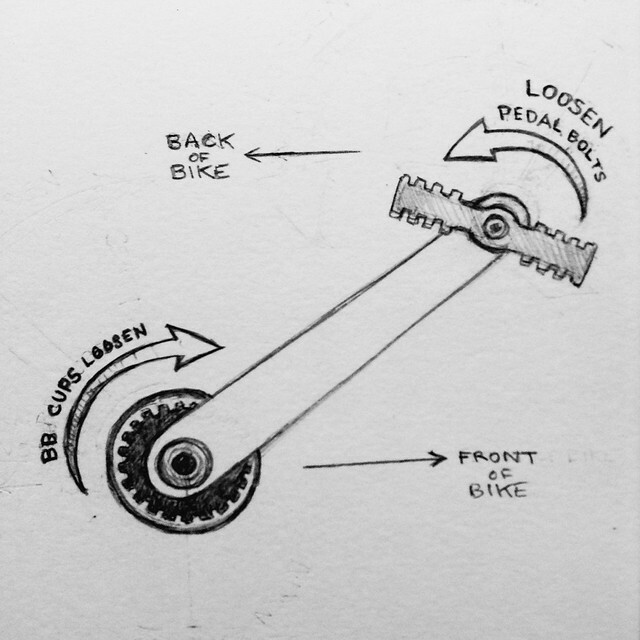 For most American and British bikes (Italian and French bikes are different (of course)), the pedals can be loosened by turning the wrench toward the BACK of the bike. 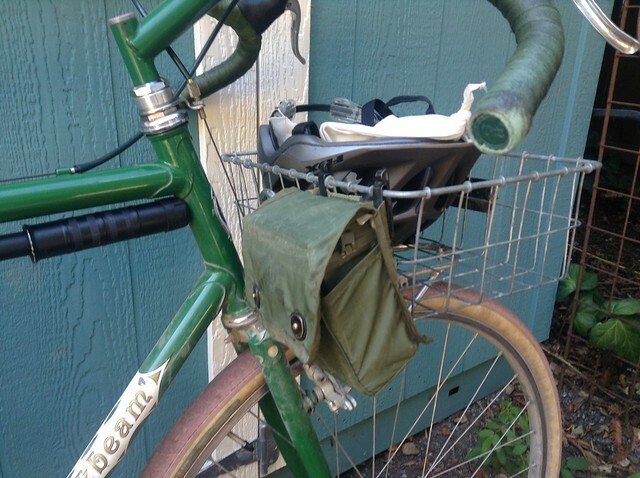 Bottom bracket cups can be loosened by turning the wrench to the FRONT of the bike. 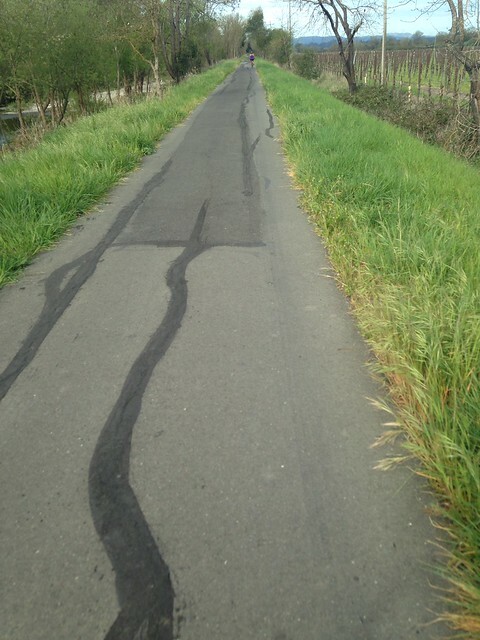 Print this out on acetate, so you can look through it from the back when you go around to the other side of the bike. 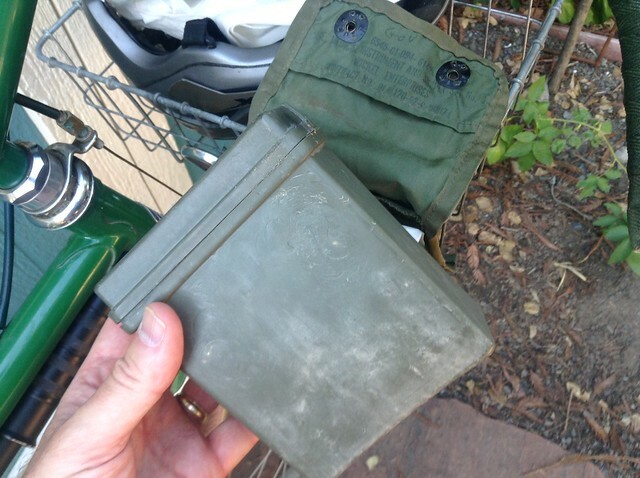 My kid and I stopped into a military surplus place in Cotati, and I picked up a little medical kit. It’s a green nylon pouch with a green plastic box inside. The box closes, and the pouch has nice snap-through hardware. 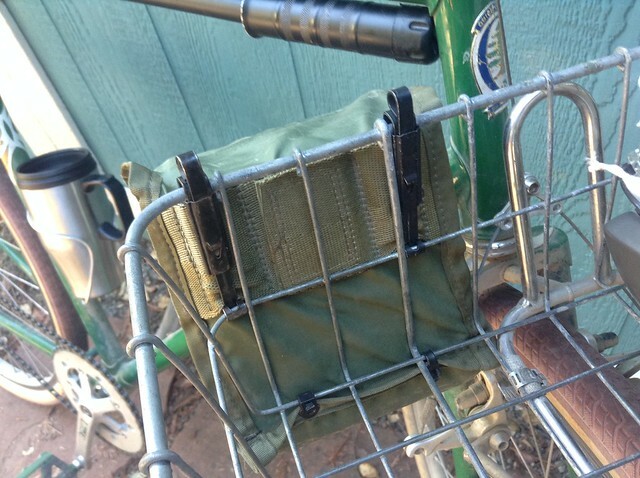 On the back of the pouch are two metal clips that lock. 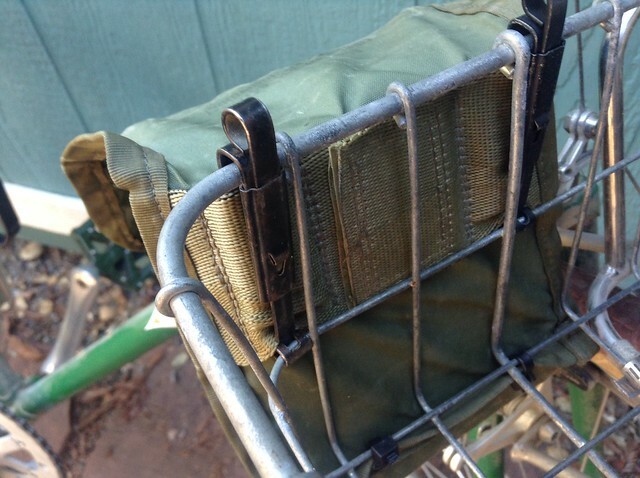 It turns out these two clips are EXACTLY the height of two Wald basket wires, top to bottom on the medium. 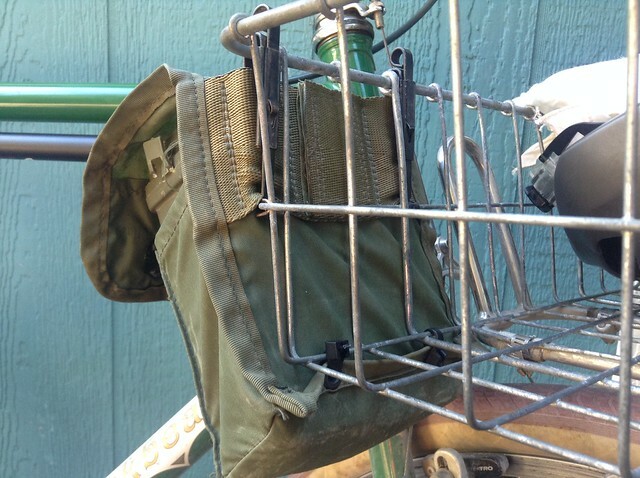 The clips snap down and lock, and there are two grommets at the bottom of the pouch that you can zip tie to the bottom wires of the basket. 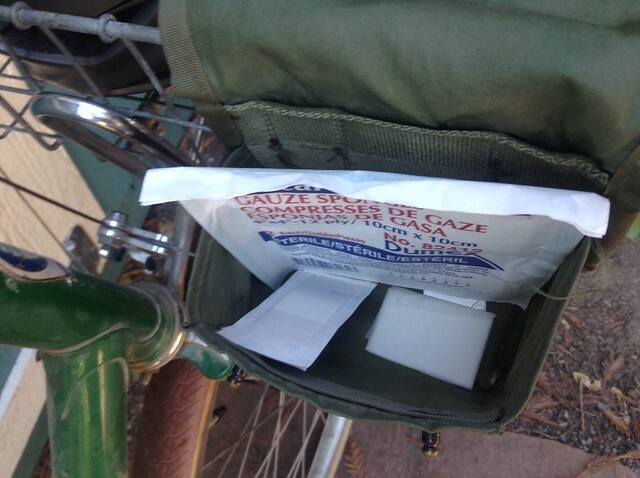 I put some first aid stuff in the pouch (since it’s a medical kit), and big gauze pad fits behind the box. My wallet fits in front. 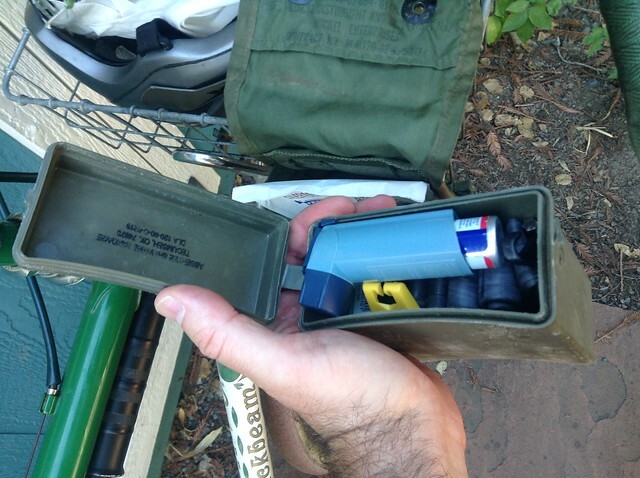 Inside is a tube, tire levers, some allen keys taped together, and an inhaler. The box is easily removed for use. And overall it complements a green Quickbeam quite well. The seller (friend Pudge) says, “There are some chips and rubs, no dents. If I kept it I would probably have had it repainted, but I’m a bit fastidious about such things.” I read that as “almost flawless,” but I am NOT fastidious about such things. 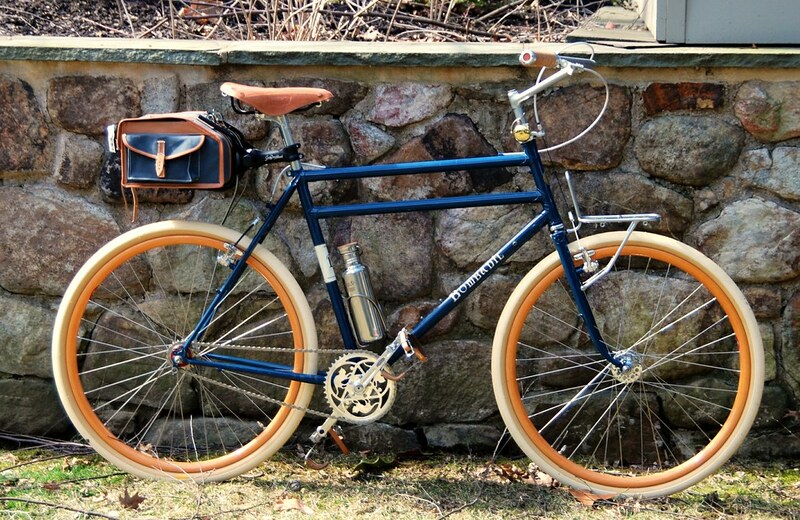 I love the solid blue color for this style of bike. 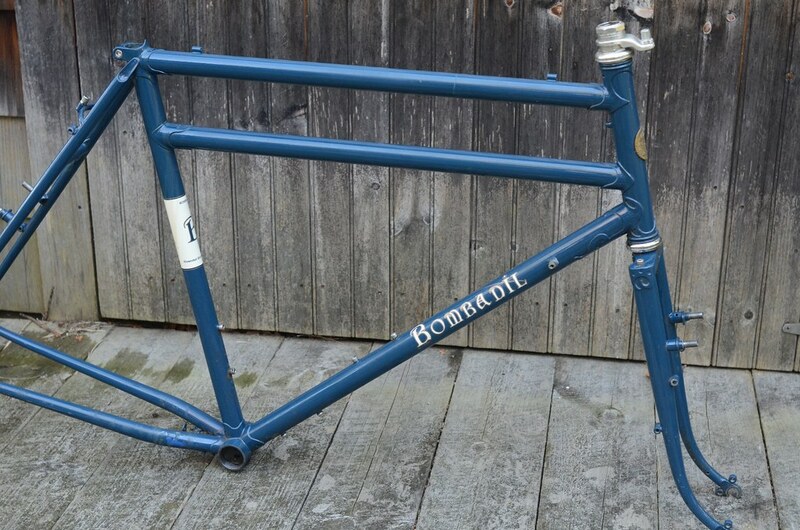 It’s an early Bombadil, with the parallel twin top tube, not the diaga-tube, and without the later “extra” mid-stays. Interested, click through to comment on the Flickr picture. 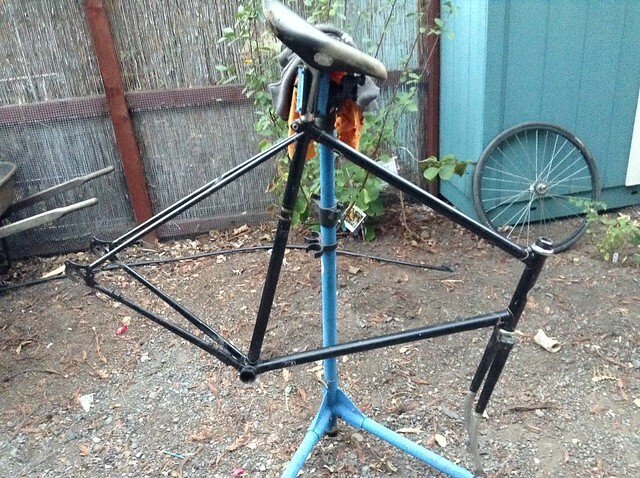 If you’re interested in the bike as built, you’re going to have to make an offer, which might necessitate some research to get values on the unique parts build. 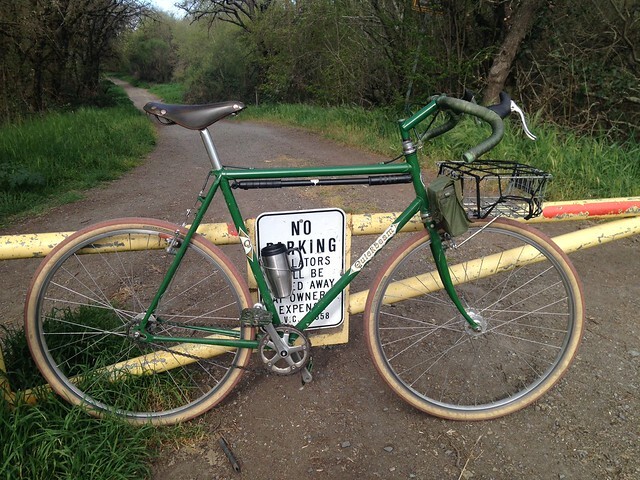 Ghisallo wooden rims, creme Hetre tires, and the great custom “cats” chainring. Put on your sunglasses, this is awesome. 56 cm frame; Nitto Lugged Stem, Mini Front Rack and Bullmoose handlebars; Brooks B-17 Select and Plump Grips; Ghisallo beechwood rims; Weigle-modified Campy front and White Industries ENO rear hubs; Bruce Gordon cantis with replacement cork pads to accommodate wooden rims; Paul Canti levers; Stronglight 49D crankset with Bespoke Chainrings “Solida Cats” 44 tooth chainring; Phil Wood pedals; Berthoud Saddlebag and rack; Grand Bois Hetres. Rolling Tires… off the rim! My new (to me) Phil Kiss-Off wheelset, WTB Dual Duty rims, and new (actually new) Vee Rubber “Mission” tires don’t seem to work together. I don’t know if the fault is with the rim, the tire, or if they’re each slightly out of spec. I rolled the tire in the neighborhood after installation, reinstalled it, it blew off, then I put the tube in another tire on another rim. Twenty minutes after installation, the tube exploded like the Death Star. 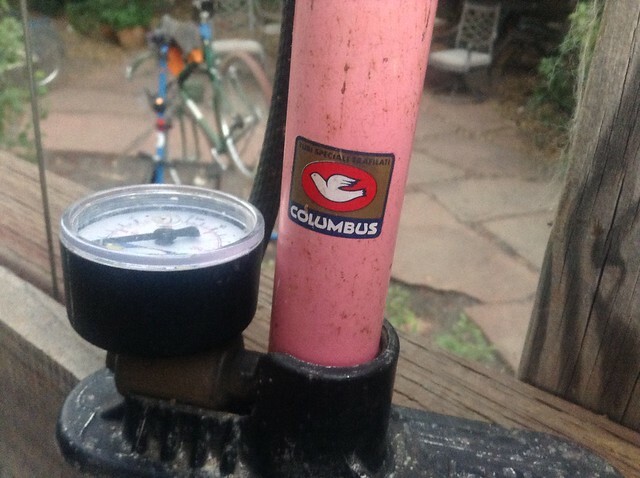 This Stan’s-filled tube off another wheel stayed on fine for two days and 1.25 rides. 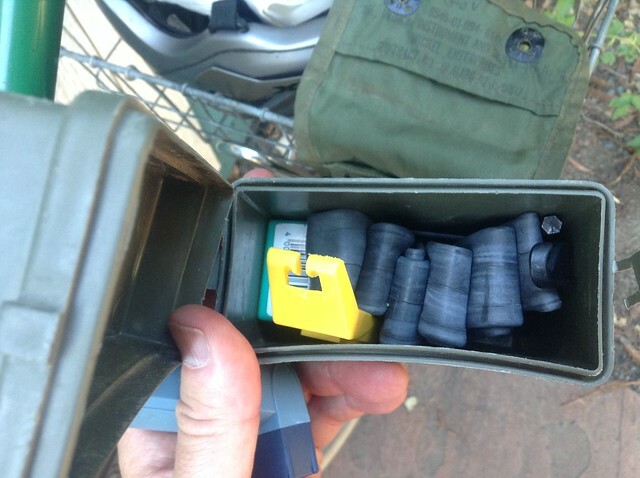 I rode home super slowly, after my riding friends bailed me out with CO2 (I bought a box of cartridges online as soon as I got back to my desk). My plan is to replace the WTB Dual Duty with a Velocity Blunt 35 (same ERD), and throw the tire in the trash. I’m scared of both of them, now! 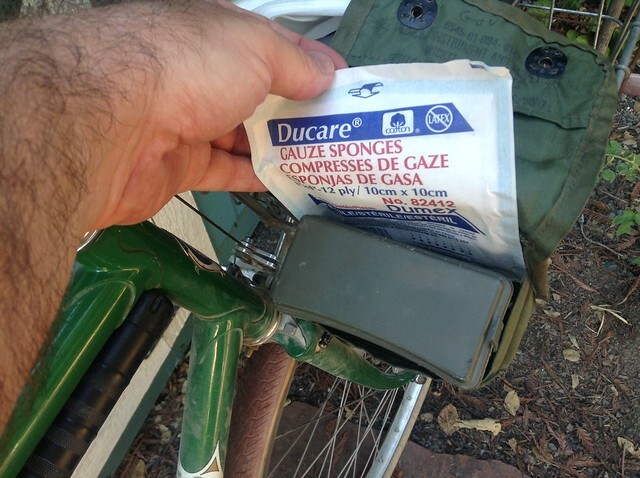 Posted on July 30, 2014 October 11, 2014 Categories rambles2 Comments on Rolling Tires… off the rim!